This “Methode Cap Classique” (bottle fermented sparkling wine) is a blend of red and white grapes retaining its fresh racy zestiness that is a result of crisp acidity and rich fruit. This “Methode Cap Classique” (bottle fermented sparkling wine) is a blend of red and white grapes displaying the full, balanced yeasty complexity synonymous with a wine made in this style. The wine retains its fresh racy zestiness that is a result of crisp acidity and rich fruit. Tradition Brut can age for at least 2 years from date of purchase. Whole bunches are deposited directly in the presses (pneumatic) and pressed very gently according to a Champagne pressing programme. Only the cuvee (the best quality juice) is used in the blend. After blending, yeast and sugar are added for a secondary fermentation in the bottle which takes 6 weeks, producing the magical bubble. The sparkling wine is matured in contact with the lees for an average of 18 months. Name - Jeff Grier & Champagne producer Jean Louis Denois. 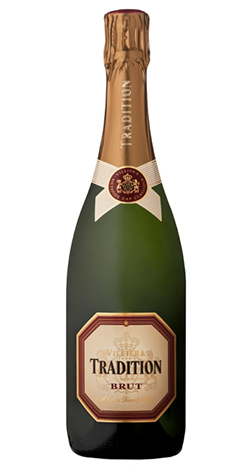 Tradition is the first Cap Classique produced by Villiera in 1984. The red label indicates the use of red varieties, which was unique at that stage. Tradition was created with the help of Champagne producer Jean Louis Denois. From Anonymous of Chicago, Illinois on 8/7/2014 . Wish I saw Villiera more easily available. Easy drinking, delicious. South Africa has a beautiful selection of wines and sparkling options. From Anonymous of San Francisco, California on 2/20/2014 .